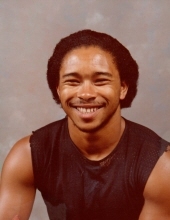 Andre Vern Dixon was born on 8/31/1958 in Denver, CO; birthed to Father Melvin R. Dixon Sr. and Mother Lila Jane Dixon. He was the fourth born child of five; Charlotte Hughes (Sister), Melvin R. Dixon Jr. (Brother), Kim Pleasant (Sister), Anton Dixon (Brother). Andre Dixon was an extremely gifted gymnast. During a gymnastic performance, he broke his ankle in two places and still finished the competition. Everybody heard his ankle pop. People were amazed to see him withstand the pain, and still compete in two more events; and win the title by the end of the competition. Andre was a man who stayed very dapper. From a young man to a grown man, his appearance would match from head to toe. It started very early; where he would buy clothes and not wear them until he had a belt, shoes and socks to match. Cindy Cortez-Dixon and Andre Dixon were brought together by their Heavenly Father. They went to California for Cindy’s Birthday, and he made sure all children met in Vegas for his 60th Birthday. They married on March 17, 2019. Andre Dixon is survived by Andre T. Dixon (Son), Vern M. Dixon (Son), Athena J. Dixon (Daughter), Aliccia M. Dixon (Daughter), Andre V. Dixon Jr. (Son), Anthony Procter (Son) and Denisea M. Carey (Daughter). He will always be remembered as the foundation of all his children’s love and strength. He is the man that taught his children about life and the meaning of love. He made sure that his kids were instilled with the want to achieve their goals, big or small. And to believe in themselves and understand their true self-worth. He also will be survived by his grandchildren Drevon T. Dixon (Grandson), Oneccia Garcia (Granddaughter), Ana’lycia Garcia (Granddaughter), Lynmonnie Dixon (Grandson), Ke’Vaughn Casais (Grandson) and Andre Veasley II (Grandson). Andre Dixon enjoyed joy riding and listening to music, dancing, and talking about his life experiences. He also loved being with his kids; and loved to cook and watch martial art movies. He really enjoyed boxing and physical competition. Just going through the positive motions of enjoying life, was something Andre took pride in. During Andres battle with Cancer, he remained strong; and he fought not only for himself, but for his kids all the way to the end. Due to his faith in the Lord, and the teachings from his Grandmother (Missionary) Annie R. Walker and the wisdom that she passed on. His faith was very strong in having a relationship with the Lord and studying his word. Andre Dixon was an inspiration to so many. Most importantly, his goal was to make a huge and positive impact on family and friends; he also touched a lot of random people that he made acquaintances along the way. He was loved by many and had many close knitted companions as well. Jannette Augilar was one of his closest friends. They were Co-Workers at Safeway (Store #1685). What connected them, was the fact that they had an amazing relationship with our children, and love spending time with our families. Even though she transferred, they stayed in touch. They hung out as much as they could. Going to Comedy Clubs was their thing, also joy riding and long talks. She believed that Andre was her educator, her friend and someone so special to talk to. He was definitely the closet friendship she has ever had in years. The #1 thing that she’ll miss the most was cruising all around Denver and listening to some old school music. The Singer Anita Bakers song, “Giving You the Best that I Got”, Sam Cooks, “A Change is Going to Come”, and Lionel Richie’s, “Easy Like Sunday Morning”. Always the best of the best, and he never complained about her singing. He helped her understand that having a friend that cares and expresses love so much is tremendously priceless. Working with Andre, she remembers all the ladies waited to go through his line. He was an amazing worker. I loved seeing him interact with customers, he always had kind words. He was always very complementary to women, just a genuine great man. Something that she will always remember about Andre Dixon SR, is he always lit up a room. His presence never went un noticed. Always a man of action. There are not many men like him; he is one of a kind. He was wise beyond his years and had a big beautiful smile to last a lifetime. 1 of his famous quotes is, “The legacy you leave behind, is not the one you can tell about yourself; but the one other’s can say about you”!!! To send flowers or a remembrance gift to the family of Andre Vern Dixon, please visit our Tribute Store. "Email Address" would like to share the life celebration of Andre Vern Dixon. Click on the "link" to go to share a favorite memory or leave a condolence message for the family.